I know we’re nearing the Maldives when the passengers around me start oohing and aahing. “Oh my gosh!” the woman next to me exclaims, leaning over for a better view. Looking below, I see what she means. The seas are an azure blue, with tiny white-sand islands sprinkled liberally across the waters below. Encircling each island is a light turquoise ring, a color I’ve only seen in photos. Suddenly, the 22 hours of flight time seem worth the trip. 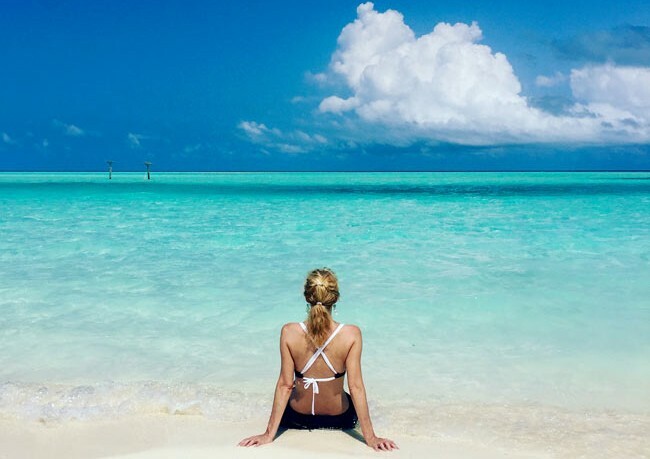 Reaching the Maldives can take some time. To find the country on a map, locate the tip of southern India, then move your finger southwest in the Indian Ocean. See that string of dots? 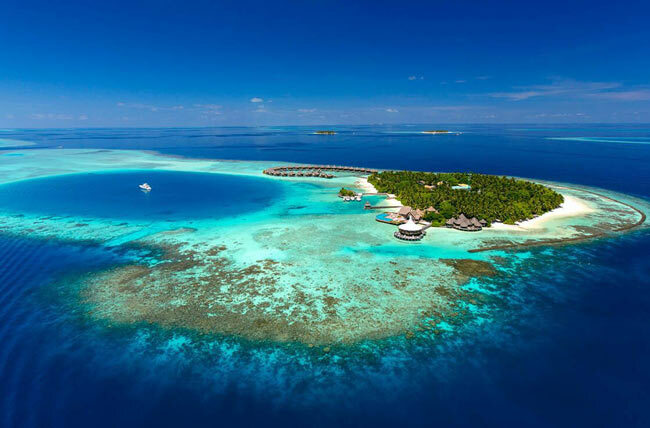 Those are the Maldives, an archipelago of 1,192 coral islands grouped into 26 atolls. 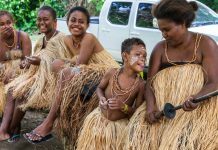 Only 192 islands are inhabited by the country’s 350,000 residents. Travelers to the Maldives fly into Malé, the capital. From there, most take a boat or seaplane to their resort. Each resort in the Maldives is its very own island. This means each resort must be self-sufficient, providing its own power, water, dining and even medical care, if needed. If you like nightlife, shopping and entertainment, the Maldives is not for you. But if you enjoy snorkeling, diving and relaxing on the most perfect beach you’ve ever seen, this is the place. The Maldives is synonymous with island luxury. Accommodations in the Maldives range from budget B&Bs to private villas that run into the thousands per night. While Maldivians follow Islamic tradition in dress and food on the local islands, resort islands follow their own rules. They operate like many other beach resorts around the world, and most serve alcohol and pork. There are more than 100 resorts islands in the Maldives ranging in size from 1.5 miles across to just a tenth of a mile. I plan to visit four of them. The author on the beach at Baros. My first stop is Baros, a luxury resort about 25 minutes by speedboat from Malé. Baros was one of the first resorts in the Maldives. Opened in 1973, it is a romantic destination popular with honeymooners. 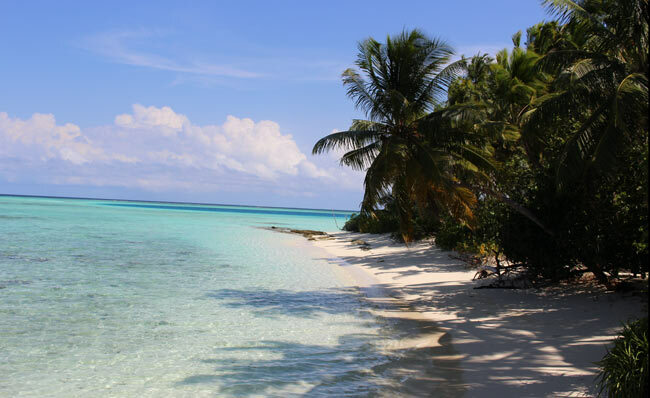 Baros also has its own reef encircling a pristine lagoon, which makes for excellent snorkeling. 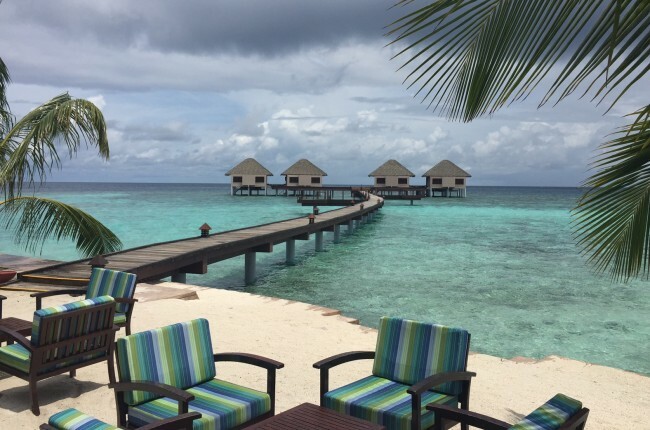 The resort has a private, intimate feel, with 45 beachside and 30 water villas. The décor in my beachside pool villa uses deep woods and high ceilings. I like the plush king bed and luxury bathroom, as well as the private outdoor shower. Behind the villa, I discover a private yard with plunge pool, a shaded wooden veranda deck with a canopied four-poster daybed, and my very own private section of the beach. Although I have no desire to leave my villa, I soon find that dining at Baros is a pleasure. All produce and food supplies must be brought in by boat, but the cuisine is fresh and innovative, with a wine list that many restaurants would envy. We linger at sunset over drinks at the iconic Lighthouse Lounge, and have an amazing dinner at The Cayenne Grill. With all this good food, I know it will be hard to stay trim for my bikini during the trip. Baros is an adults-only destination. 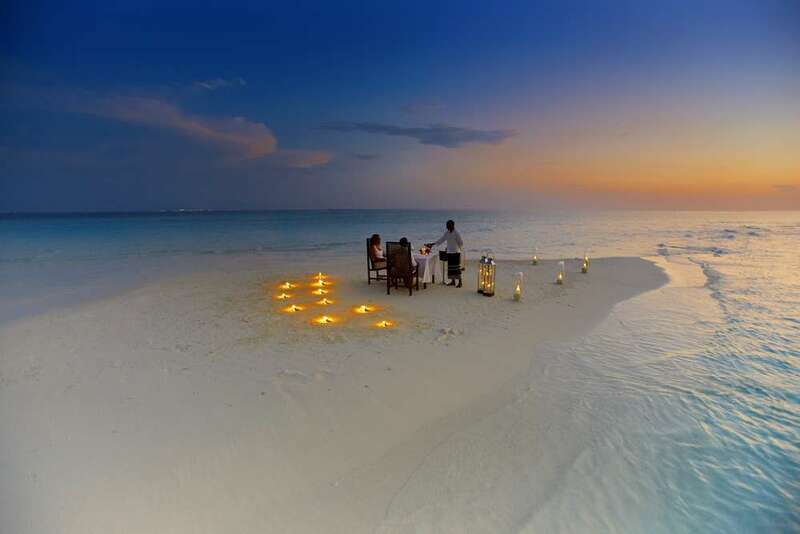 One of the highlights at Baros is a private dinner on The Sandbank. It’s just what it sounds like – a private dinner for two prepared and served by your own private chef on a small sandbank in the middle of the crystal blue sea at sunset. 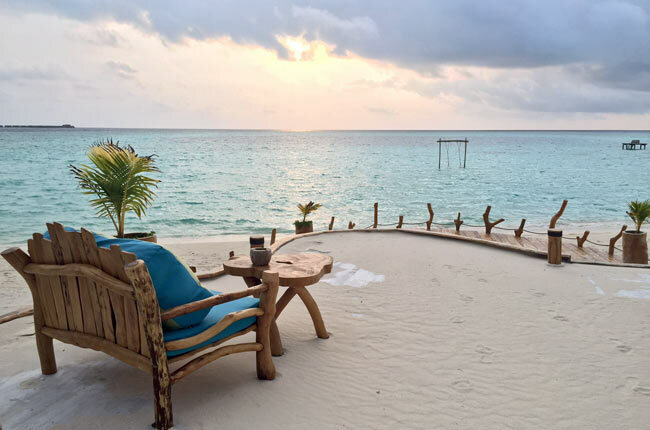 Baros offers a a private dinner for two on a small sandbank at sunset. Photo courtesy Baros. On our last day at Baros, a friend and I spend the morning snorkeling. We walk straight into the sea from our villa doors, and within minutes we’ve reached the reef. Hundreds of colorful fish and bright coral surround us. The water is so warm that it almost feels like a bathtub. We snorkel until we tire, and then walk back along the shore, happily chatting about what we’ve seen. From Baros, we take a boat to Adaaran Prestige Vadoo, a larger resort which has a youthful feel to it. I see many young couples and families from Asia, India and elsewhere. Most guests purchase the resort’s all-inclusive plan, which includes meals. 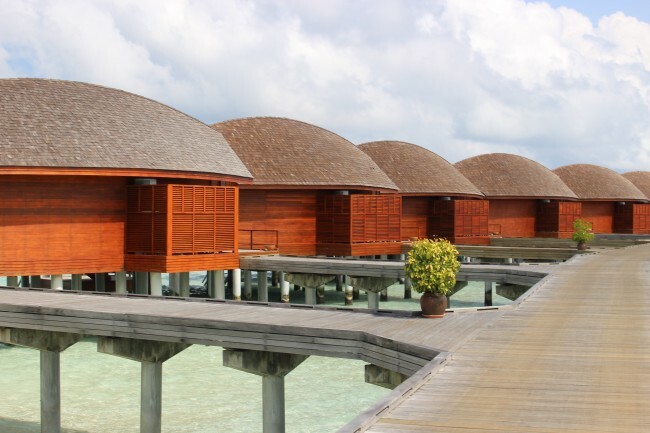 Adaaran Prestige Vadoo has 50 water villas, each with their own plunge pool and private deck. 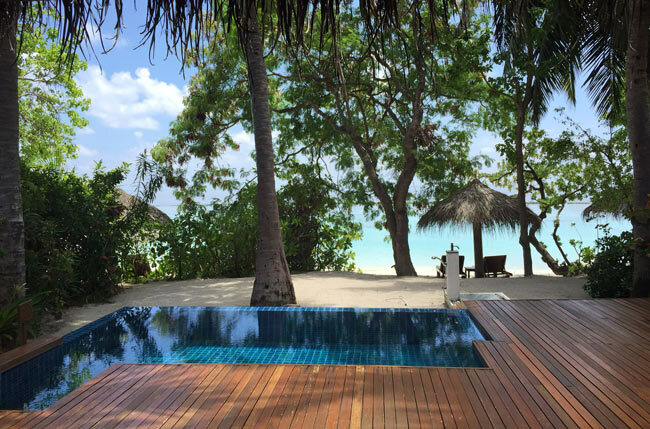 The villas sit above turquoise waters, with unrestricted access to the Indian Ocean. Six of the villas follow traditional Japanese design. My villa has a see-through floor section that allows me to see the clear seas below, and I make good use of the steps going down to the ocean, where schools of fish can be seen from yards away. Adaaran Prestige Vadoo has an active feel to it, and I see many snorkeling, playing beach volleyball and on jet skis. There is also water skiing, tube rides and even a whale submarine excursion that takes passengers some 120 ft below the surface. The staff at Anantara Dhigu welcomes us with traditional drums, cool towels and coconut drinks when we arrive by speedboat. The resort is one of three Anantara island resorts which sit side by side, each with its own style. Anantara Dhigu welcomes guests of all ages, including families with children. For kids age 11 and under, the Dhoni Kids Club has a supervised program that changes daily. Anantara Dhigu has 110 villas and suites. I can’t help but smile when I see my over-water villa with its large rooms and private wooden deck with stairs leading down to the sea. 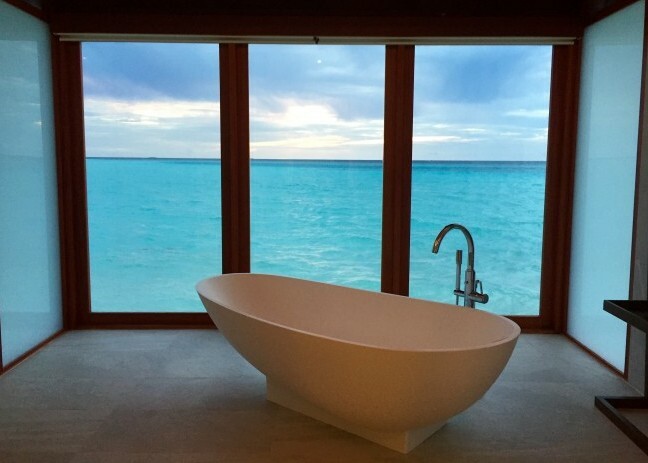 But it’s the stand-alone tub with floor to ceiling windows looking out to the open ocean that makes me want to jump for joy. As I look out the window, I see a huge stingray pass in the turquoise waters below. Dining at Anantara is a highlight, and there are more restaurants than we can sample during our stay, from Japanese to Italian to seafood. Maldivian cuisine has many of the spices and tastes that I like in Indian and Sri Lankan foods, yet has its own unique dishes. 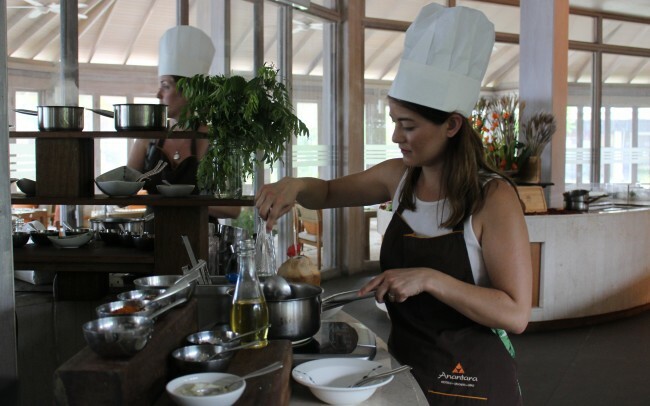 During a Spice Spoons cooking class at Anantara, my friends and I try our hand at making a three-course menu of Maldivian dishes, including a scrumptious fresh tuna curry (under expert guidance, of course). Best of all, then we get to eat it. Anantara has a strong commitment to protecting the environment, and I’m thrilled to take part in the resort’s Coral Protection and Regeneration Program called HARP (Holistic Approach to Reef Protection). 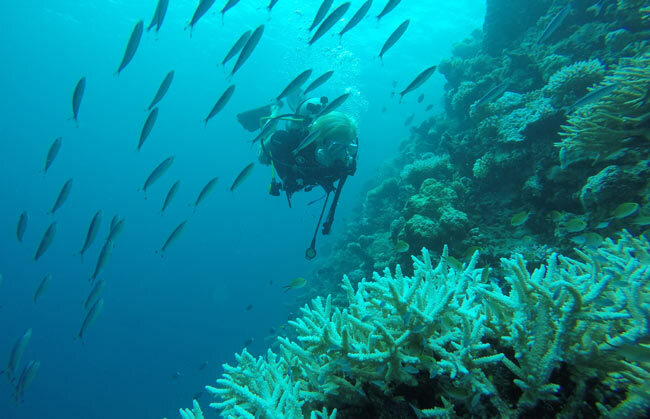 Anantara has teamed up with marine biologists from Coral Reef CPR, whose goal is to promote sustainable management and rehabilitation of reef ecosystems, and they encourage resort guests to join those efforts. Guests can participate in a coral reef propagation program by adopting a coral frame and planting it under the guidance of Anantara’s resident marine biologists. When Dr. Andrew Bruckner, the program’s chief scientist, takes us snorkeling at a spot near the resort, he shows us how the coral is changing color, obvious signs of its distress due to rising water temperatures. 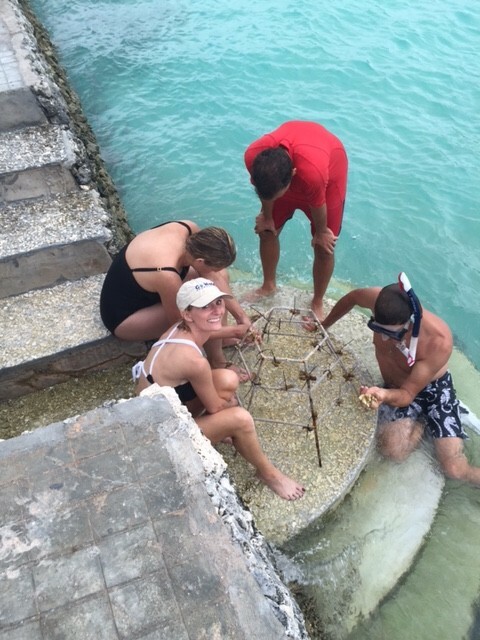 Back at the resort, he shows us how to carefully attach damaged pieces of living coral to a wire frame, which will then be placed back into the sea. He explains how the pieces will begin to attach and grow as healthy coral. Sad to leave Anantara Dhigu at the end of our visit, I’m happy to know that there are a few small (but growing) pieces of coral in the Maldives that I helped along. We fly by seaplane to our final island stop, AaaVeee, which is one of the newest resorts in the Maldives. 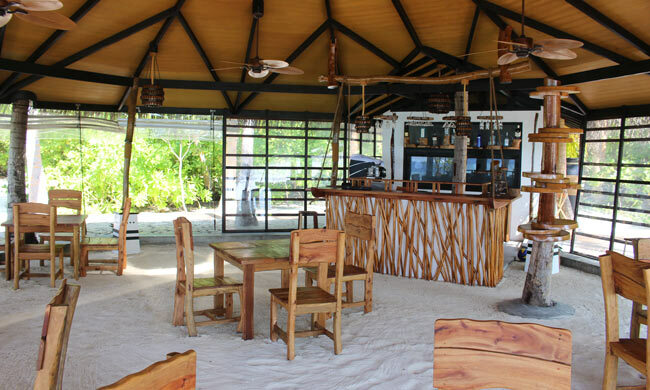 Committed to being environmentally friendly, the island resort makes the most of its native trees, foliage and shoreline, with sand pathways and even a sand floor in the open-air restaurant and bar. 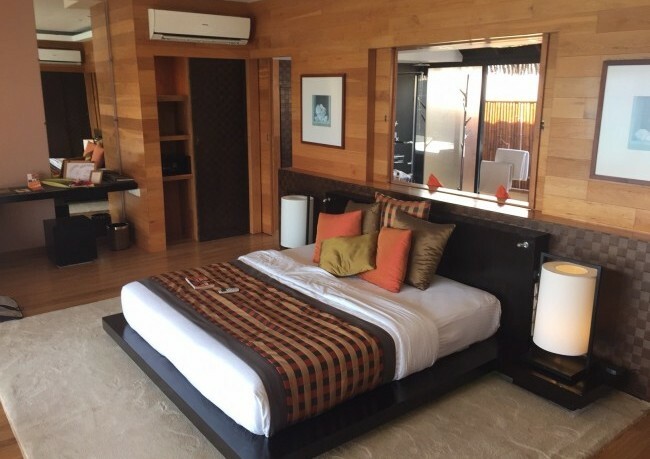 Our private villas have wood floors and furnishings that were crafted from coconut trees on the island. It’s here at AaaVeee that I feel most connected with Maldivian culture. The resort is locally owned, and seems committed to sharing the Maldivian way of life. One afternoon, some of the staff ferry us to the tiny neighborhood island of Rinbudhoo, which has a population of 594. There, we’re greeted by the island’s young president, who introduces us to his family and then gives us a tour of the island. We stop at the school with its open-air classrooms, and then peek inside the mosque, which has exquisite hand-crafted wood artistry by local artisans. He shows us how the island collects rain water and stores it in huge barrels for their water needs. 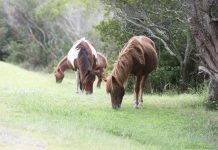 We meet several locals, and learn more about life here. The next day at AaaVeee, we decide to go diving. AaaVeee is a well-suited for divers and snorkelers. The island has a healthy reef and a well-outfitted dive shop with skilled dive masters available to help. While two of my friends take their first intro dive lesson, I head out on a dive. Often when I dive, we have to take a boat to the dive spot. But today, after helping me gear up, the dive master signals me to follow him. We walk down to the beach and then into the sea. Within minutes, we reach an extensive reef. Everywhere I turn, I see wide fan coral, huge starfish and large schools of fish. The dive master points out an orange clown fish peeking out from a sea anemone, and then we snap a selfie with an underwater camera, the ocean scene our vibrant backdrop. The author diving at AaaVeee in the Maldives. Although I love diving, I usually struggle with getting too cold. But here, the water is so warm that I don’t even think of it. I continue to swim along the reef, fascinated by the diversity of sea life here. I’m disappointed when the dive master signals that it’s time to go back up. Later on, we experience the ocean from a different perspective. Fishing is an important part of life here in the Maldives, and when we get the chance to go fishing with some of the staff, I jump at the chance. Not that I’m an expert fisherman – I really don’t even know how to bait a hook – but I want to experience everything I can here. The staff don’t use rods; they simply put a hook on a roll of fishing line. They help us bait our hooks, and then encourage us when we haul up our catch. The cooler is soon filled with a variety of fish; the majority are red snapper. The chef at AaaVeee has promised to serve up our catch at a beach BBQ later that evening, and I’m looking forward to this fresh seafood. It’s dark when the boat finally heads back toward the shore. “Why don’t you go up on the roof deck and check out the view?” one of the staff suggests. I climb the tiny ladder and then lie flat on the roof, looking into the sky. Without light pollution to hide them, I can see thousands of stars twinkling in the sky. I’m awed by the sight, and lie there the whole way back. As the engine hums and the boat gently rocks, I know that I’m just a tiny speck in this great big universe. But here, near these small dots of land in the middle of the Indian Ocean, I realize what a special corner of the world this is. Qatar Airways and Emirates are among the airlines that fly to Maldives. International flights arrive at Malé’s Abrahim Nasir International airport. There are direct flights to Malé from Dubai and many European and Asian cities. Coming from the United States, I flew with Qatar Airways from Boston to Qatar to Maldives. 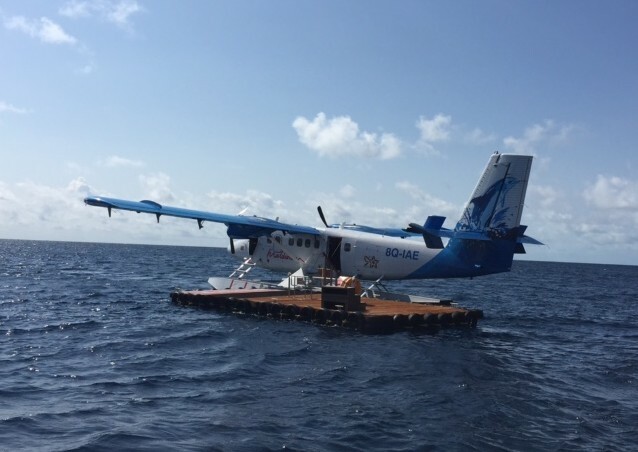 After flying to Malé, you’ll take a boat, domestic flight or seaplane to your resort, depending on how far it is. If you go by seaplane, be aware that seaplanes only operate in daylight hours. Seaplanes usually land at a floating platform near the island, and then guests are transferred by boat to shore. Resorts located closer to Malé use boats for transfer. 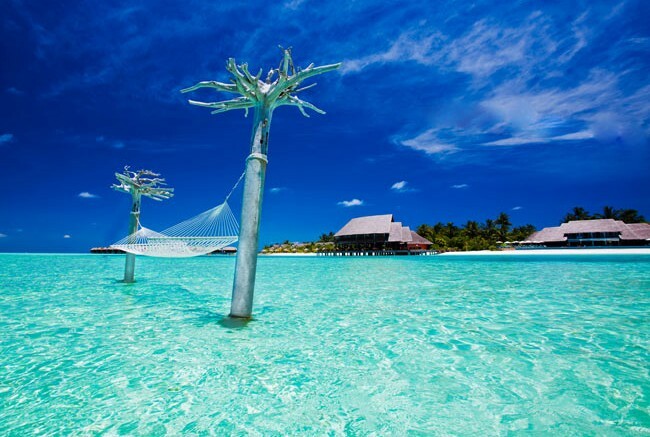 Located on the equator, the Maldives has warm tropical temperatures year round, ranging from 74° F (23°C) to 90° F (32°C). It is quite humid and hot at times, so dress appropriately. 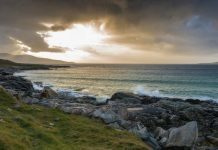 The islands have two distinct seasons. From May to October, intermittent rain showers can be expected, followed by dry weather from November to April. The Maldives currency is called the “Ruffia” (MVR); however, most resorts price items using the US dollar. Major credit cards are accepted at resorts.